Rudi Westendorp (1959) is professor of Medicine at Old age at the Faculty of Health and Medical Sciences at Copenhagen University, Denmark and director of the interdisciplinary Center of Healthy Ageing exploring aging from cells to society. 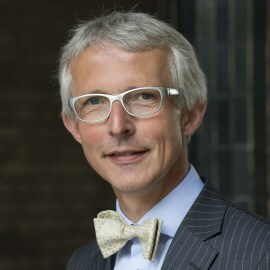 He was chair of the department of old age medicine at the Leiden University Medical Center, Netherlands (2000-2014) and founding director of the privately funded Leyden Academy on Vitality and Ageing (2007-2014) that pursues societal innovations to improve quality of life of older people. He acquainted ample (inter)national grants, published more than 600+ scientific articles and supervised over 50+ PhD students of which three of them have been appointed full professor. He published the bestseller ‘Growing older without feeling old’ that is translated in nine languages (2014), was endowed doctor honoris causa by the University of Newcastle, UK (2009), and received a knighthood in the order of the Dutch Lion (2014).